PanARMENIAN.Net - San Francisco's Mt. Davidson Memorial Cross - one of the oldest landmarks in the city and a memorial to the 1.5 million victims of the Armenian Genocide - was recently vandalized, SFGate reports. As the conversation around the treatment of migrant children at the border gets more heated, hostility toward the immigration-enforcement arm of the U.S. government has become visible. Someone appears to have spray-painted a message of solidarity with immigrant families on the cross. "No more violence. This blessing is for the families in detention centers, for the families experiencing U.S. funded wars. 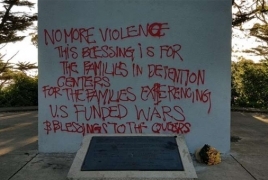 Blessings for the queers," the red lettering reads. A visitor to the park, Toby Morgan, photographed the graffiti. 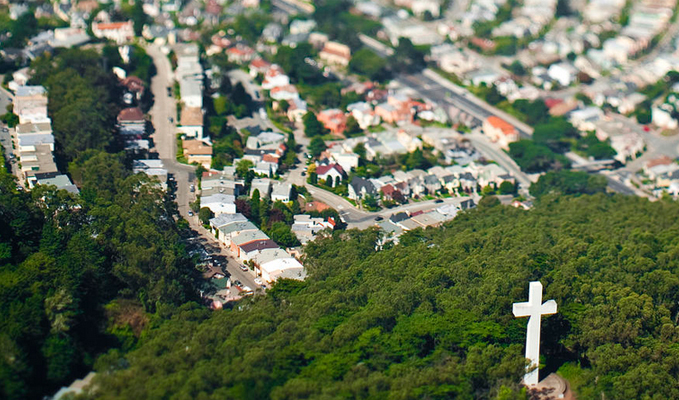 The enormous concrete cross, which has stood atop San Francisco's highest hill since 1934, was erected to commemorate all those who were killed in the Genocide under the Ottoman Empire. A representative from the Council of Armenian American Organizations of Northern California said they are "saddened" by the incident and have reached out to law enforcement. "We are notifying the police and will have it painted today," a representative said Friday. "We understand peoples need for self-expression, vandalism such as this is never appropriate."